A Policy Acknowledgement Form, where the user indicates he or she has read and understands the included policies. The capability to edit your policies upon receipt to fit your company's needs exactly. Over 40 pages of custom security policies containing hundreds of policy statements, loaded with information to share with auditors, use as an IT security manual, or set company policy. The ability to upgrade to our Gold package for a reduced price (please note that it is less expensive to opt for the larger package initially rather than upgrade). Our 100% satisfaction guarantee. We don't think you'll need to use it based on our 98% customer satisfaction rate, but rest assured that if you aren't satisfied with your purchase we'll give you your money back. Please accept my payment and immediately give me access to InstantSecurityPolicy.com's security policy creation wizard. 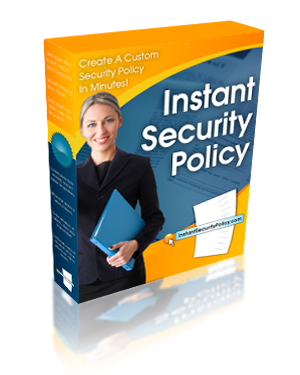 You will complete the questionnaire to create your custom security policies. You will click a link to immediately download your policies and forms. Company * Please make sure this is spelled exactly how you want it to appear in your policy.